Notes on the current limit resistors for the 4QD series. The control board current limit resistors have changed frequently, as MOSFET improve the Rds generaly decreases. This increases the current, but it has to be constrained within safe limits. The 4QD series controllers were originally aimed at golf buggies and similar terrestrial applications where reverse is not used much and reverse current does not need to be as high as forward current. The 4QD series use a full bridge circuit and since the forward hiside is conducting forward current all the time and is not chopped, this is where most heating will occur and if MOSFET current limits were ever pushed to the limits, this is the first place than should fail. So the bridge included one extra MOSFET in this arm to reduce the dissipation here. The reverse current in the standard controllers was therefore set to about 75% and the forward current. A separate page details the MOSFETS that have been used. There are two resistors that are changed form time-to time to control the maximum current limit, these are in parallel so Ri(a) is fitted on asll boards, and Ri(b)n is added to compensate for the higher Rds(on) of the 48v MOSFETs. The chart below shows the values in use August 2012 to date. 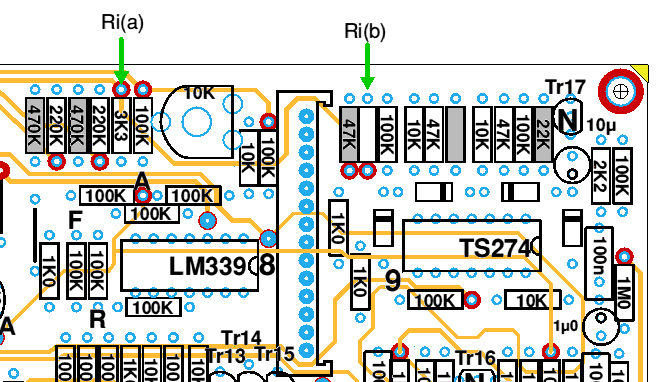 The drawing shows the issue 18 control board: greyed out components are not fitted. Earlier boards may vary slightly.